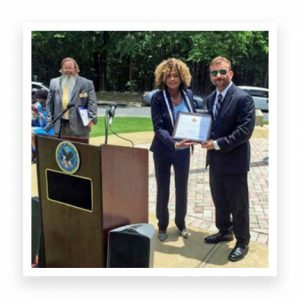 Dr. David DiRamio is presented a Certificate of Special Congressional Recognition from Michelle Sands, Field Representative for Rep. Sanford Bishop (D-GA), while Todd Newkirk, Assistant Director of the Fort Mitchell National Cemetery, looks on​. On the afternoon of May 28, David DiRamio, Ph.D., an Associate Professor in the College of Education’s Department of Educational Foundations, Leadership, and Technology, delivered the Memorial Day keynote address at Ft. Mitchell National Cemetery. DiRamio served in the United States Navy from 1980-1986. His research focus is on veterans education. His address to those gathered for the event is included below. Of particular relevance is DiRamio’s emphasis on women who have served in our military, and the call to be mindful of the plague of mental health and substance abuse issues that all too often accompany soldiers who return from stress-filled tours of duty. Thank you Dr. DiRamio for a well-wrought and very important address. WRBL television, Columbus, Georgia, covered the ceremony. Closely related to DiRamio’s research and personal experiences, ESPN.com recently ran a story on the positive impact becoming involved in extracurricular activities can have on U.S. military veterans who leave the Armed Services and return to school – which is what 60 percent of them do at some point. In particular, the article by Dan Murphy recounts stories of how veterans who get involved in college football have a much better time connecting with the college or university at large. Along with quoting legendary University of Texas coach Mack Brown, Murphy talks to DiRamio. He explains how college campuses feel foreign to many veterans, and that one of the biggest factors that determines whether veterans complete their degree is the extent to which they become involved on campus. It’s a fascinating study, and you can read the complete article. Thank you for having me on the program. I want you to know it’s a heartfelt honor to stand before you, my fellow Americans and patriots. Please let’s acknowledge our active duty service members, including Guard and Reserve, and their families. I am grateful for your service. To my fellow veterans and our families, I stand with you; and to those kind souls who may not have served in the military themselves, but gladly devote their time, treasure, and compassionate support, including the higher education community, my own school, Auburn University, and many faculty, administrators, staff, and students who I work with daily. Please indulge me a moment, as a research professor studying veterans education for nearly a decade, to share my biased opinion that both Auburn and the University of Alabama are among the top veteran-friendly campuses in the nation. This is something that we Alabamians can be proud of. Oh, and our friends from Georgia are right there with us. However, as we all know, our ceremony today is for those who are NOT here with us. Those who made the ultimate sacrifice in active duty military service to our great nation. Memorial Day is one of our most solemn and humbling observances, but one cannot help but stand tall with pride when hearing of the valor, honor, and selfless service of those who lost their lives in combat. Today’s Ft. Mitchell National Ceremony program lists those same virtues as our theme today: Service—Honor—Valor! In addition to our fallen heroes and combat duty, I have a reason to remind myself that Memorial Day remembrances include all service members who served on active duty and gave their lives, perhaps not in combat or during a time of war, but in service to our country, nonetheless. My grandfather, MU1 Robert Clark—Musician First Class Petty Officer in the U.S. Navy—died on active duty. Grandpa Clark played clarinet in the official Washington, D.C.-based Navy Band. On the way to perform for President Eisenhower and the President of Brazil, tragedy struck when their Navy transport plane collided with a Brazilian plane in dense fog in Guanabara Bay near Rio de Janeiro. Nineteen sailors, including my grandfather, lost their lives in what has come to be known as the US Navy Band Air Disaster of 1960. Some of the old timers still remember that disaster, which was headline news at the time. Grandpa was laid to rest at Arlington National Cemetery, where my mother, then just 17 years old, was presented her father’s ceremonial triangularly folded flag by then Vice President Richard Nixon. Our family cherishes Grandpa Clark’s flag. My middle name is Clark. When considering the cost of freedom in terms of lives lost the numbers are staggering. More than 405,000 Americans perished in WWII; 116,000 in WWI; 58,209 in Vietnam; nearly 37,000 in the Korean War; and a total of 6,850 service members died during the wars in Afghanistan and Iraq (through 2014). In total, since 1776, more than one million Americans have paid the ultimate sacrifice in service to our great nation. Each of us attending the ceremony today stand on the shoulders of those who have gone before us to preserve the freedoms and blessings that we relish. This is the essence of Memorial Day. All who have served are the “greatest” in my mind. However, we know that our WWII veterans, coined as the Greatest Generation by news anchor and author Tom Brokaw, served the country with valor, then came home and transformed America. In my privileged role as a college educator, I’m often reminded that, in much the same fashion as the original post-WWII GI Bill recipients helped transform this country during the second half of the 20th century, our group of more than 400 student veterans at Auburn along with 2.5 million of their fellow OEF/OIF/OND veterans across the nation, may well be forming what will be the NEXT “Greatest Generation.” Who better to lead our nation in the future than the men and women who served our country admirably in Afghanistan, Iraq, and during this period of protracted military conflict and the all-too-frequent threat of terror? In fact, I contend that the current generation of service members and veterans represent EXACTLY what this country needs to address the myriad of serious problems we face today. Now I would like to take a moment to recognize our fellow military service members who are women: mothers, daughters, sisters, wives, girlfriends, and, in my case, some of the most important people in my life today. For many of us, including me, who have served in previous decades, the stereotypical image of a military service member is purely male. My own research over the years confirmed that gender is of paramount significance in military culture, which has power and authority structured along the lines of two main factors: (1) masculinity peppered with machismo and (2) whether or not one has served in combat. Unfortunately, female service members fall short on both of those criteria, sometimes in name only because they weren’t supposed to be assigned combat roles until recently. Yet, fifteen percent of those who served in Iraq were women (that’s one in seven) and a total of 280,000 have returned from deployments in Iraq and Afghanistan over the last decade. Since the attacks on America on September 11, 2001, a total of 147 women who were deployed to Afghanistan, Iraq, and Kuwait have lost their lives in active duty service to our nation. Rest assured that their stories are no less dramatic or less heroic than the men in our service branches. The majority of these women were killed by improvised explosive devices (IEDs), which is, of course, the signature injury of today’s wars, and many of the others who lost their lives died in military transport crashes. I looked into it and 21 were mothers of one or more children aged 18 and younger. One female soldier in Iraq, whose body was shattered by an explosive device that she was attempting to disarm, died in the arms of her soldier husband who was stationed nearby. Our fallen female service members deserve special distinction for being the trailblazers for future women entering the armed forces and, of course, the heroes that they are. I salute all of you ladies who selflessly serve in the military, the greatest military the world has ever known, and one that is today better off and a more productive organization because of you. I salute you. I know today’s ceremony is one of honor, humility, solemnity, and a well-deserved tribute to those who have secured the blessings of liberty with their lives. Tomorrow is Memorial Day, so please be sure to take time out to reflect on those virtues. However, I would be remiss if I did not get off my chest a lingering problem that is of paramount importance today. So, with all due respect as we pay our respects through our Memorial Day ceremony to those who have lost their lives, both women and men, as well as to those whose life stories have been irreparably altered by physical injury in service to our country, I must not stay silent on this issue. So, the signature injury of the wars in Iraq and Afghanistan is traumatic brain injury (TBI) due to a concussive blast. Unfortunately, while I continue to pursue my research agenda studying veterans education, I’m increasingly finding that the signature “CURE” for many who have returned from war with untreated problems is substance abuse and self-medication using drugs and alcohol. Of course, too often this misguided way of dealing with one’s problems leads to suicide. The lack of leadership on this issue and an absence of effective mental health policy in our society are exacerbating the problem and is, to me, extremely serious and disconcerting. So, as we leave today, I want you to keep in your thoughts and prayers, those veterans, many who still suffer mightily from injuries, both physical and psychological, associated with the Vietnam era, along with today’s returning Afghan and Iraq vets. My final comment, as we take today and tomorrow to thoughtfully reflect on the true meaning of Memorial Day, is a quote I borrowed from an officer who served on active duty on a small patrol boat (PT 109) in 1943 in the Solomon Islands and, at one time in our history, emerged to be the most powerful man in the world. That combat veteran is President John F. Kennedy who said, “As we express our gratitude, we must never forget that the highest appreciation is not to utter words, but to live by them.” Thank you and God Bless the United States of America. David DiRamio, US Navy veteran (1980-1986), Ph.D.